Khaled Hosseini is remarkable for telling tales about the bonds that cement people together and shape our lives; how we define each other; and the choices we make that resonate through history. His readers have walked through complicated relationships, father-son dramas, traumatic experiences of domestic violence, and riots and communal violence. 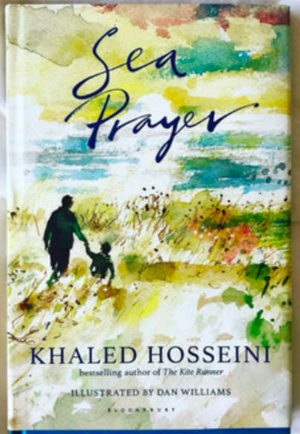 In Sea Prayer, Hosseini walks his readers through a short, poetic epistolary book, which details the dehumanising effects of war, and tries to excavate elemental emotions in readers. It is also a vivid painting of life in Homs, before and after war. Homs is a homonym of ‘homes’, everything of which is lost in a deadly war zone. While recounting a personal narrative, Hosseini also alights on what his country went through. At its subjective core, the book advocates for a humanitarian and ethical realisation. In his past writings, Hosseini has explored displacement: Amir flees to California in The Kite Runner after the Soviet invasion of Afghanistan; Laila and Tariq go to Pakistan because of the Taliban’s bestial regime in Afghanistan in A Thousand Splendid Suns; in And The Mountains Echoed, Abdullah and Pari leave Afghanistan, only to reunite years later in California. These themes of displacement and disillusionment recur in his latest book, but of course, with a different stylistic pattern and literary knack. The bedrock of Hosseini’s latest book is the periphery of the European refugee crisis. In fact, Hosseini clearly states that the book was inspired by the image of a three-year-old Syrian child of Kurdish ethnicity, who drowned on September 2, 2015 in the Mediterranean Sea in an attempt to reach Europe. The photographs of his body taken by Turkish journalist Nilüfer Demir made global headlines. With a keen understanding of this historicity, Hosseini brings this poignant account forth to tell of the plights of parents under such cataclysmic circumstances. The book suggests that the writer too, emotionally identifies with the situation he can imagine between the drowned boy and his father. The protest, riots and bombardment in countries like Syria and Afghanistan in recent years have given rise to an unbearable scale of disenchantment and disillusionment, which compel many people from war zones to attempt to find a new home. This is also a moment for a father to reflect upon an idealised past, gilded with the flowers of happiness and peace. The past seems like a dream—a “long-dissolved” rumour while the present is characterised by sputtering bombs, starvation and death. At the moment, the “dark news is the better news than the bright”. In the book, the father speaks to the son that they—Afghans, Somalis, Iraqis, Eritreans and Syrians—are “unwelcome and uninvited”, and they have to carry their misfortune elsewhere. However, the unfathomable sea that bars their way to a new home suggests the uncertain and insecure futures of those displaced. For refugees, hope is all that remains. A closer inspection of the book brings to light some parallels. First, as son grows, the country too grows from peace and harmony to riot and turbulence. Next, with the rise of uncertainty in the son’s future, the country and its future too become uncertain. The emotional bonds shared by the characters amidst adverse circumstances sheds light on similar relations that all refugee brothers and sisters, fathers and mothers share. Sea Prayer speaks subtle shades of emotions, mainly because of the spectacular illustrations by Dan Williams. These watercolours range from monochrome to polychrome, with varying degrees of significance. The totality of colours in the illustrations form a journey: verdant colours dominate while vividly portraying the uncontaminated past and the complacent life around Homs, Syria; these colours fade as the country enters the vortex of war and protest. Again, dainty strokes fill the dark colours as they accompany the pessimism and hopelessness of the father. A charcoal horizon hints at the bleak predicament that awaits those who seek new homes. Similarly, the vast sea stroked green and blemished with dark-gloomy colours contrasts with how powerless the father is while protecting his son from an uncertain destination and destiny. The last thing that remains for the father is hope, which has been symbolically patterned with green and subsequently, light colours. Yellowish colours suggest the rays of something good, probably new homes for refugees. This book, though small in size, is without melodrama. It charges its readers with emotion. There is a voice inside the words, pleading for peace and the rights of all humans.